It is with great sadness that we communicate to International Catacomb Society directors, sponsors, and friends news of the death of ICS founding member and longtime executive officer, Florence Z. Wolsky, on 28 February 2018, in Woburn, MA (link to obituary). Our thoughts and prayers are with ICS president, Alfred Wolsky, Esq. and other members of Florence's family at this time. Information about services is not currently available, but ICS hopes to arrange a tribute to Florence's legacy and dedication to the society as soon as it is possible to do so. At this time, we think only of the Kel Maleh Rachamim (For the Soul of the Departed): "O G-d, full of mercy, Who dwells above, give rest on the wings of the Divine Presence , amongst the holy, pure and glorious who shine like the sky, to the soul of Florence, for whom prayer was offered in the memory of her soul. Therefore, the Merciful One will protect her soul forever, and will merge her soul with eternal life. The Everlasting is her heritage, and she shall rest peacefully at her lying place, and let us say: Amen." May her memory be for a blessing. Florence, we miss you so much. 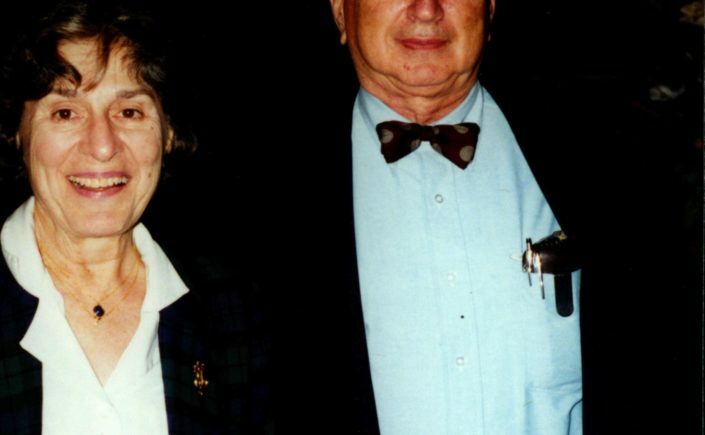 Pictured - Florence with her husband, Dr. Leonard Wolsky, MD, at an International Catacomb Society event in 1994.